In my first reading of the Rights of Persons with Disabilities Bill 2012, I was very glad to see it being included under the heading ‘Right to Live in the Community’ the words used in this section are very similar to what the CRPD says making it even better. Until yesterday when I was sitting and reading the Bill along with colleagues when we together looked at it trying to understand it more deeply and understand the changes it would bring to lives of disabled people. The Bill recognizes the right of all persons with disabilities shall have the right to live in the community and have choices equal to others. I am assuming the choices means choices of places and living arrangements they can live in, but from the Bill it is not clear so as a non legal person I am not sure how the courts would interpret these choices as. The bill puts a duty on the State to ensure that persons with disabilities are not forced to live in a particular arrangement; that the persons with disabilities must have access to community support services; and community services and facilities must be available to persons with disabilities. All these are very much needed and must be provided, but there are some serious concerns looming in my mind that I would like to share. I am not a lawyer and hence not sure if they are legitimate. As I see the Article 19 of the CRPD in the Indian context there seems to be a wide difference in what it means in urban and rural India. While in the urban areas it may for some persons with disabilities mean living with their family yet being able to exercise their autonomy while for some it may mean living outside their family setup with the support they require. I the rural setup where a lot of times there is a struggle to meet the bare minimum basic requirement, where rights have little meaning, for a disabled person it can often mean just being allowed to exist within their family setups. Considering 70% Indian population is in rural areas, it will be a pity if this extremely important section does not address their needs most explicitly and bring a positive change in their lives. Having Access to an accessible home or shelter is one of the basic requirements to fulfil Article 19. That is the only way to provide those ‘choices’ the Bill promises in real terms. When I see this in the Indian context, I would not hesitate to say that we are far from having ‘choices equal to others’ but that doesn’t mean that we would never get their. Appropriate steps by the government in the right direction can definitely get us their someday. But today when I see the situation the basic need of accessible shelter is often denied to persons with disabilities. In Delhi I know of countless persons with disabilities who live in homes that are inaccessible and are often unable to even step out of homes living on upper floors without a lift. From my recent experience with home modifications for persons with disabilities in rural areas, it came as a surprise to me when parents and joint family members refused to allow modifications to be made to their house so that the resident with disabilities could have access just till the toilet and out of the house. They refused for modifications even if they were not going to bare the cost of modifications. Homes are not public buildings hence not covered by the Bill. 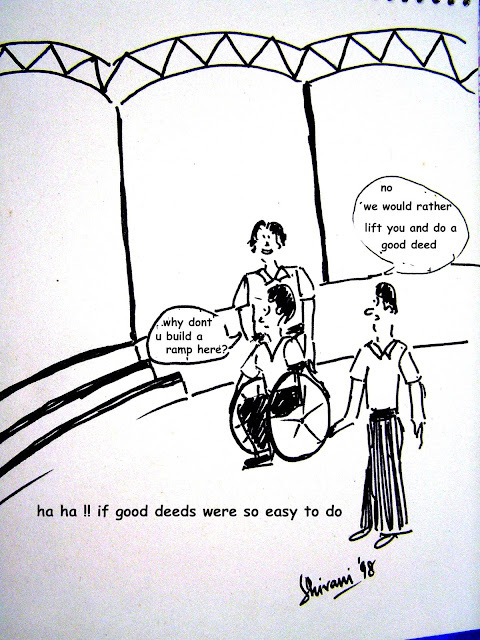 It is the parents or the family not agreeing to either shift to an accessible accommodation or make modifications; so what is the recourse for the persons with disabilities or for DPO’s can take to enable these people with disabilities who are jailed in their own homes to realise their human rights? · Should the State not protect this basic right of the all persons with disabilities to have access to an accessible shelter/home even if it means ensuring that parents/families provide accessible living spaces? · Should the State not provide support to such families that need to shift or make modifications? · Should not all new public housing projects by default be universally designed? · Should not the right to rent accommodation by a persons with disabilities be protected and should not the persons with disabilities by allowed by the property owner to make reversible adaptations on their own cost? These are just some questions that are in my mind based on my limited experience, I confess I have no idea of what Right to live in the community and have choices equal to others even mean in the context of persons with psychosocial disabilities and also Intellectual disabilities where being institutionalized. I am more cautioned in light of the probability that the Metal Health Care Act may be tabled for discussion in the winter session in spite of all our collective advocacy against it. It is good to see that the State has recognized the importance of community support services such as personal attendants to enable persons with disabilities to live independently and participate in the community. Again seeing it from an Indian context the way they are provided in rural and urban areas may greatly differ and would require a lot of debate and understanding of what are the community support services required for persons with different disabilities and what may be the mechanism to provide it based in the geographic and socio-economic backgrounds. Of course this can be postponed till the Bill becomes and act. My thoughts right now are around whether ensuring access to community support services can be interpreted as State also providing financial support to those who may be eligible to avail of this community support and Subsidizing the cost of community support services? Again I am very happy that the State has recognized the importance of this aspect in being able to live independently but I am a little alerted by the use of the word ‘available’ and not ‘accessible’. In my opinion the two are very different and can take it from a right based to a medical model. I am also concerned that there is a definition of services (which is very urban centric if I may say so) but there is no definition provided of facilities. Again my concerns are around urban and rural differences and the need to ensure that clean drinking water points, sanitation even if it is shared and village roads, panchayat meeting places, local market, ration shop etc. must get adequate attention and be included as part of community services and facilities. Lastly in the entire section in the bill why is the concept of ‘Living Independently’ been completely eliminated? As a layperson I am unable to comprehend the implications of it but as a disabled person I value the concept and would like it to be provided in the Act.